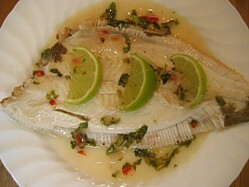 When you’re looking for something different to grill on the BBQ why not try this grilled sole recipe with a lime infused fish sauce? BBQ grilled sole is really moist, it’s a flat fish so it cooks reasonably quickly and I find that you can cook it on one side and it’s ready so none of the problems with fish breaking up when you try to flip it. Sole has quite bony fins so when you buy one, get your fish monger to trim the fins and take the head off while he’s / she's about it. With all that done, you’re ready to go, you can simply season it with salt and pepper and slap it on the grill or if you’ve got a bit more time then try this tasty sauce that really complements it. 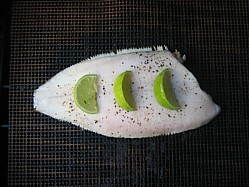 TIP - I did this grilled sole recipe on a Teflon BBQ fish mat because this made presentation really easy. When cooked I removed the whole mat from the grill, placed the serving dish on top and then flipped the lot. 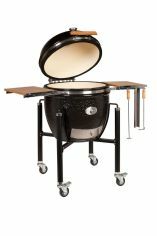 If you grill the sole dark skin side down you get a beautifully colored result with crisp skin that’s easy to remove. To make the lime fish sauce, add the zest of one lime and the juice to all the other ingredients (except the fish), bring to the boil and give it a stir...that's it, sauce done. The sauce needs to be served warm. I mix it in a glass jug so that I can give the sauce a quick blast in the microwave when the fish is ready to be plated up. Brush the sole with olive oil to stop it from sticking to the grill or fish mat and season on both sides with salt and pepper. Slap it dark skin side down on the grill, lay wedges of the second lime on top and give it about 10 minutes. You’ll be able to see when it’s done because the slightly translucent side of the fish that’s visible will turn white. Serve with the crispy brown skin side up either skin on or off depending on your taste. To portion out your BBQ grilled sole, trim away any remaining bones of the fins on the outside, these will come away easily now that the fish is cooked and then part the fish off the bone from the center. If you’re careful and use a fish slice you’ll end up with 4 succulent strips of fish from each whole sole so all you need now is to pour over the sauce and get a nice glass of Sancerre from the refrigerator!